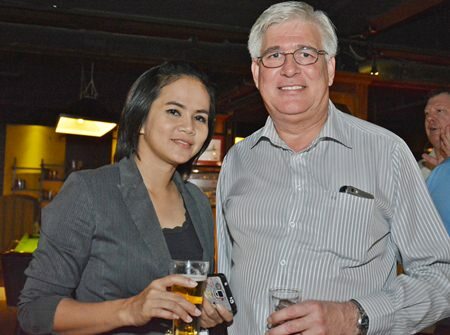 The latest Joint Chambers Networking was hosted by AustCham and held in conjunction with the American Chamber of Commerce in Thailand (AMCHAM), the British Chamber of Commerce Thailand (BCCT), the German-Thai Chamber of Commerce (GTCC), the South African Chamber (SATCC) and The Belgian-Luxembourg/Thai Chamber of Commerce (BeluThai) and with special guests from the Netherlands-Thai Chamber of Commerce. 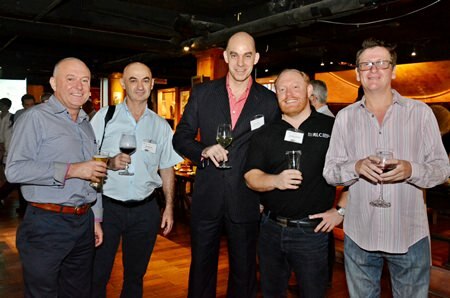 Add to those groups, the Automotive Focus Group (AFG) who held their networking meeting immediately before and were invited to join as well in the Dicey Reilly’s Irish Pub venue of the Marriott. 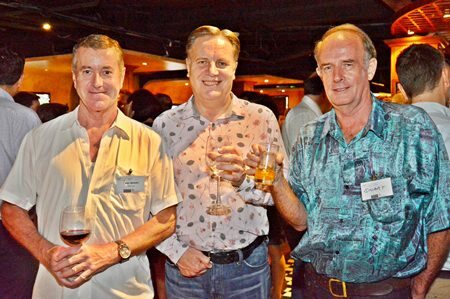 Ensuring everyone was enjoying themselves was Matthew Fryar, Director of Operations of the Pattaya Marriott Resort & Spa who was seen welcoming Stewart Gilson, International Marketing Executive of Bangkok Hospital Pattaya and Dr. Iain. 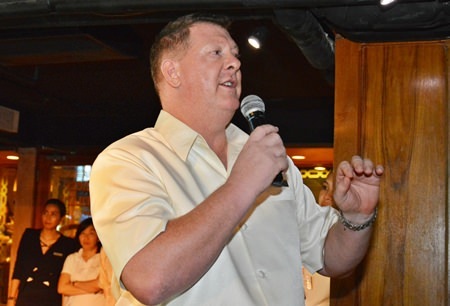 Matthew Fryar, Director of Operations of the Pattaya Marriott Resort & Spa welcomes the guests. 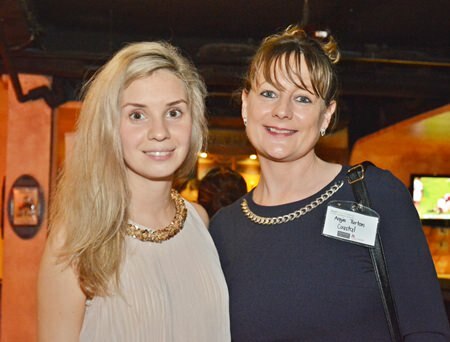 Despite some slowing down in the real estate business, the big players like Nigel Cornick, CEO of Kingdom Property, were still upbeat and his Marketing Manager of Kingdom Property, Irina Breslavtseva, was seen chatting to Angie Turton, the Development & Admin Manager of Coastal Real Estate. 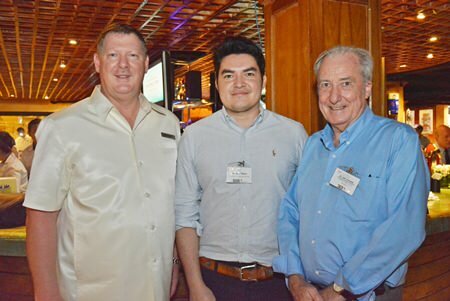 The automotive industry was well represented with Ron Grigaras, Engineering and Program Manager of MHG Thailand, Frank Holzer, Executive General Manager of MHG Thailand and President of the AFG, Thomas Wilson and Martin Kasten from Ford Motor Company. 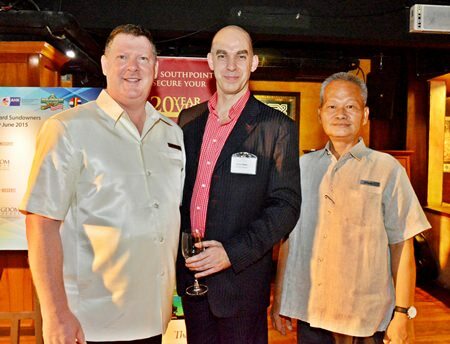 Nigel Cornick, CEO of Kingdom Property speaks about the benefits of purchasing a new condo in South Point. 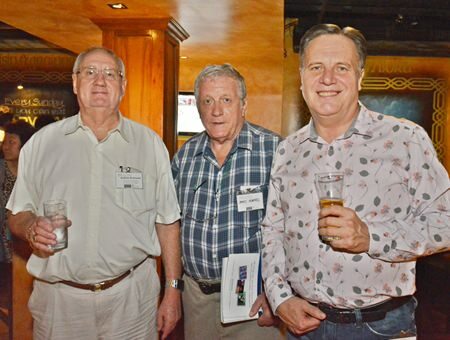 The regulars were all there with Richard Jackson, General Manager of RLC Recruitment, Greg Watkins, Executive Director of the BCCT, and Graham Macdonald, President of the SATCC. 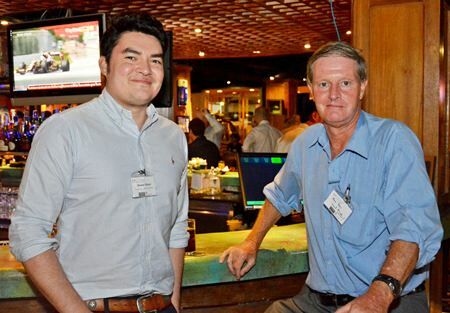 Also in the regulars were James Howard, consultant with Milan Crosse Creative Ltd., and Simon Matthews, Country Manager Thailand, Manpower Group and famous for his ‘noisy’ shirts. 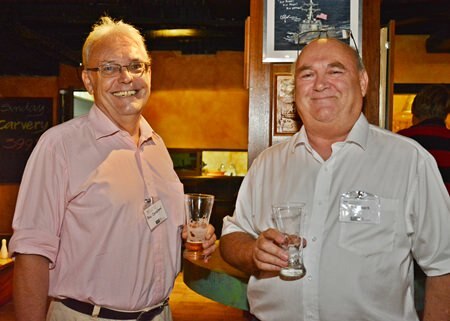 Looking at becoming a regular, Greg Wallis, Senior Trade Commissioner, Minister-Counsellor of the Australian Embassy was demonstrating the famed Australian affability. Alain Deurwaerder, Vice President of the Belgian-Luxembourg/Thai Chamber of Commerce and also in the AFG appeared to be in deep consultation with quite a few of the networkers. 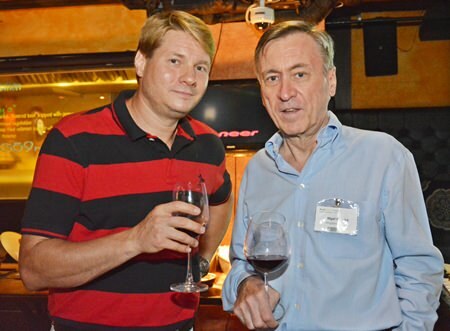 Nutkanoknunt Sattayapun, Senior Manager/Sales of Nova Platinum Hotel and Frank Holzer, Executive General Manager of MHG Thailand Co., Ltd. The Marriott took the opportunity to discuss how their hotel could fit in with some of the companies, and Jakarapol Uthaipong, Account Sales Executive and Mittana Chamoyklang, Account Sales Manager of Pattaya Marriot Resort & Spa joined Mark Bowling (Colliers International) and Voraruetai Pongisarawanich, Assistant Sales manager for Courtyard by Marriot at South Pattaya. Stalwarts at these events were Michael Diamente, Director Asia Operations for AMM Thailand, Roseanne Diamente from Women With a Mission, Paul Wilkinson, International Operations Manager for CIES (Thailand), and Mark Bateman, Executive Business Manager for PRTR Recruitment and Outsourcing (Eastern Seaboard). Irina Breslavtseva, Marketing Manager of Kingdom Property chats with Angie Turton, Development & Admin Manager of Coastal Real Estate. Despite the event being held by the Marriott, this did not stop others in the hospitality industry attending, with Rangsima Seaksiri, Director of Sales – Pattaya Marriot Resort & Spa, Sumitra Deekham, Assistant Sales Manager, East Coast and Pornthip Saengrat, Sales Manager, East Coast – Royal Cliff Hotels Group, getting together. 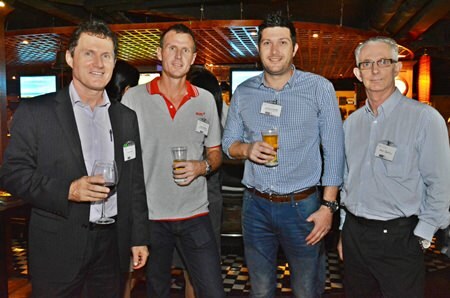 It was a very well attended event, as most of the AustCham events are, with Joshua Hyland, Vice President of the AustCham, and Alexandra Cullum, the new Executive Director of AustCham seen circulating all evening. You can contact AustCham on [email protected] or call 02 210 0216. 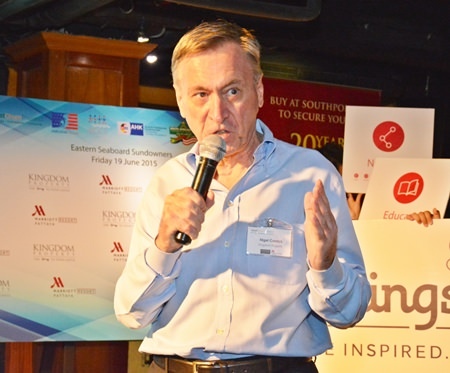 The next Joint Chambers event in Pattaya will be held in the Hard Rock Hotel and hosted by the BCCT. 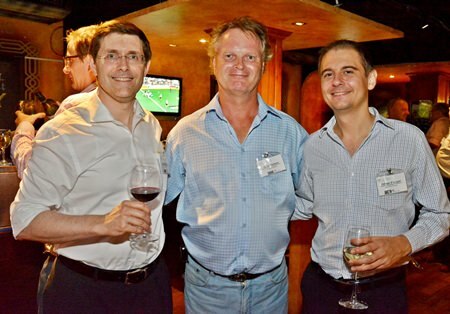 Peter Mewes, Senior Legal Advisor of HBS Law, Simon Matthews, Country Manager Thailand – Manpower Group, and Stuart Saunders. 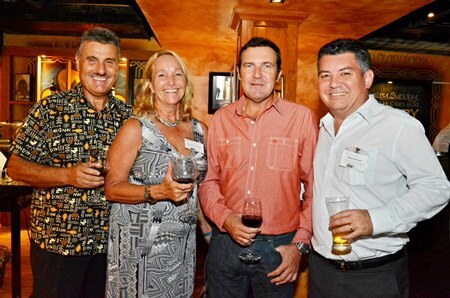 Bobby Vanleeuw from Luxestate, Jan Ools, and Nigel Cornick, CEO of Kingdom Property. Surawut Chatboonreung and Porntip Arayasongsak from Air France chat with Sittichok Puttakun, Account Sales Manager of Pattaya Marriot Resort & Spa. Jakarapol Uthaipong, Account Sales Executive & Mittana Chamoyklang, Account Sales Manager of Pattaya Marriot Resort & Spa join Mark Bowling (Colliers International) and Voraruetai Pongisarawanich, Assistant Sales manager for Courtyard by Marriot South Pattaya for a chat. Michael Diamente, Director Asia Operations for AMM Thailand, Rosanne Diamente from WWM, Paul Gerard Wilkinson, International Operations Manager for CIES (Thailand), and Mark Bateman, Executive Business Manager for PRTR Recruitment and Outsourcing (Eastern Seaboard) Co., Ltd.
Daniel Hatzler, Horst Wiezorrek, International Business Consultant of Pacific Cross Health Insurance PCL, Torben Eichhorn, and Michael Berger from A and O Trading Co., Ltd.
Matthew Fryar, Director of Operations of the Pattaya Marriott Resort & Spa, Simon Shale, Visy Packaging (Thailand) Limited, and Somsak Tanruengsri, General Manager of Pattaya Marriot Resort & Spa. 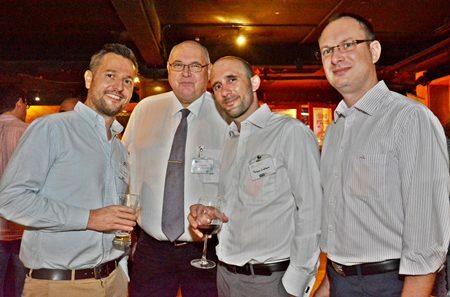 Nick Fox, Vice President of Pionvan, Ilya Roitman, CEO of Soft Control, Simon Shale, Visy Packaging (Thailand) Limited, Richard Jackson, General manager of RLC Recruitment Co., Ltd., and David Pollock. 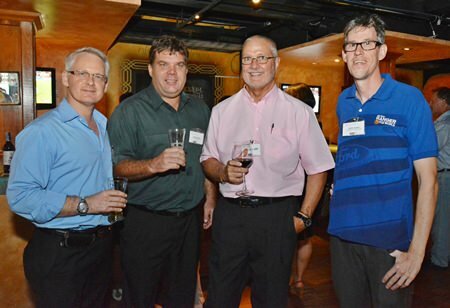 Alain Deurwaerder, Vice President of the Belgian-Luxembourg/Thai Chamber of Commerce, Ron Grigaras, Engineering and Program Manager of MHG Thailand, Thomas Wilson, and Martin Kasten from Ford Motor Company. Greg Wallis, Senior Trade Commissioner, Minister-Counsellor of the Australian Embassy Thailand, Matt Karkness, General Manager of SMR Automotive System (Thailand) Limited, Jonathon Sheaffe, Manufacturing Manager of Tinfish (Thailand) Ltd., and Mike Griffis, General Manager of Harrington Industries (Thailand) Co., Ltd.
Stewart Gilson, International Marketing Executive of Bangkok Hospital Pattaya, and A. Alexander Tees. 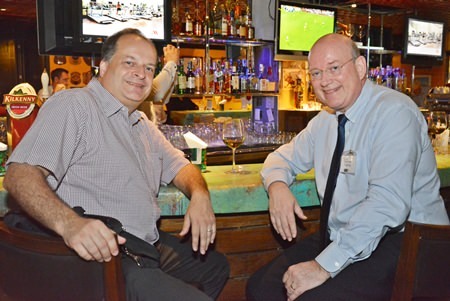 Alexander J. Hutton-Potts, Managing Director of Simplicity International Co., Ltd., chats with Nigel Cornick, CEO of Kingdom Property. 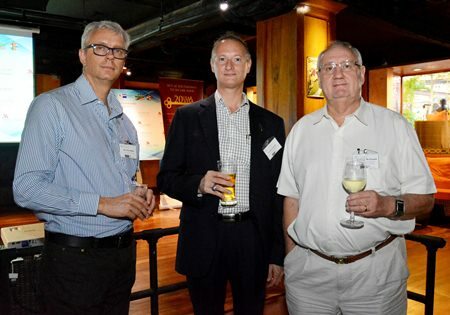 Nigel Cornick, CEO of Kingdom Property, Ron Pitelka, and Alexander J. Hutton-Potts, Managing Director of Simplicity International Co., Ltd.
Greg Watkins, Executive Director of BCCT and Graham Macdonald, President of the SATCC. Paul Cockman and Jeff Powers. 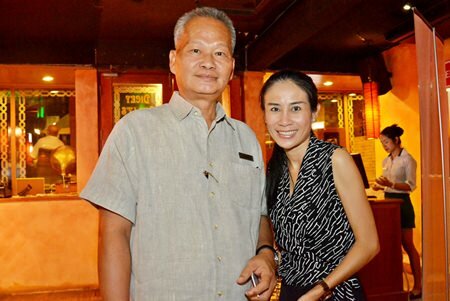 Somsak Tanruengsri, General Manager of Pattaya Marriot Resort & Spa, and Vassachol Khrueasan, Assistant Director of Sales-Cape Dara Resort. 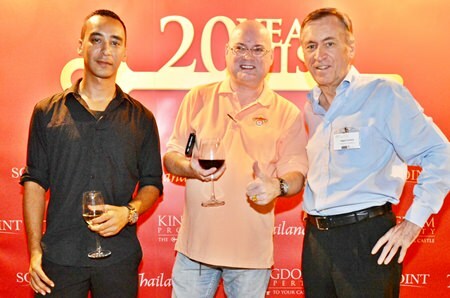 Andrew McDowell, Group Managing Director of Vinarco International, James Howard, consultant with Milan Crosse Creative Ltd., and Simon Matthews, Country Manager Thailand, Manpower Group. 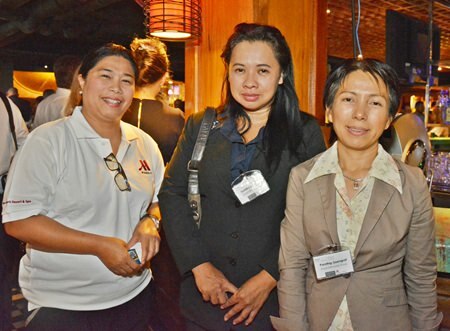 Rangsima Seaksiri, Director of Sales – Pattaya Marriot Resort & Spa, Sumitra Deekham, Assistant Sales Manager, East Coast, and Pornthip Saengrat, Sales Manager, East Coast – Royal Cliff Hotels Group. Dennis J. Meseroll, Executive Director of Tractus (Thailand) Co., Ltd., Hakan Carlsson, and Philippe D’acquet, Managing Director of Smartsoft Asia Co., Ltd.
Matthew Fryar, Director of Operations of the Pattaya Marriott Resort & Spa, Stewart Gilson, International Marketing Executive of Bangkok Hospital Pattaya and Dr. Iain Corness. 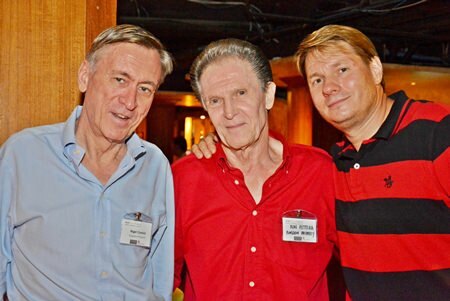 Peter Weiss, Regional Director Asia Pacific of Suretank Thailand Co., Ltd., Frank Timmons, Managing Director of Apichet Technology Co., Ltd., and Andrew McDowell. 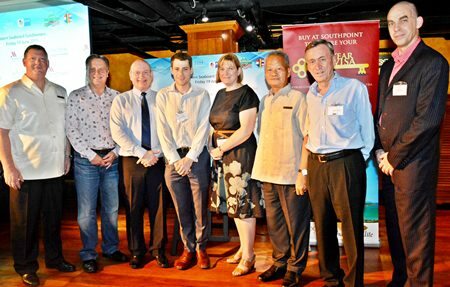 Matthew Fryar, Director of Operations of the Pattaya Marriott Resort & Spa, Simon Matthews, Country Manager Thailand, Manpower Group, Graham Macdonald, President of the SATCC, Joshua Hyland, Vice President of AustCham, Alexandra Cullum, Executive Director of AustCham, Somsak Tanruengsri, General Manager of Pattaya Marriot Resort & Spa, Nigel Cornick, CEO of Kingdom Property, and Simon Shale, Visy Packaging (Thailand) Limited.